Both, of you ask me. When I was a kid I loved this guy. His TV specials made me want to become a magician. with wonder for the world — it’s fascinating and miraculous. A lot of people lose that. They become cynical and jaded, especially in modern day society. Magic renews that wonder. Dude! You were a skilled and totally entertaining magician. Sometimes a bit weird, but always charming and totally authenitic. Thanks for being an inspiraion. Check out what Doug Henning (helped to) inspire here. https://www.bradmontgomery.com/wp-content/uploads/2018/11/logo-1-495x198-1-300x120.png 0 0 admin https://www.bradmontgomery.com/wp-content/uploads/2018/11/logo-1-495x198-1-300x120.png admin2006-12-30 23:10:512006-12-30 23:10:51Doug Henning: Motivational Speaker or Magician? Proof! Humor can make you healthy. I had the lucky pleasure of meeting a kind woman named Sandi at Pure Romance training event in Ohio (where I was doing my motivational speakers thing.) Sandy shared with me that she had been going through some tough times; her dad is dying of cancer. We’ve been in touch with an ongoing discussion about her dad’s amazing sense of humor; and how he has kept up the smiles, laughter, and practical jokes throughout this ordeal. I am just writing you today to give you an update on my dad and to ask you a question. first the update. My dad is still hanging in there. He is terminal and his time is getting closer. I took a temporary leave of absence from work to help him in his final days. My dad still has his humor. Today when the hospice nurse was over, she was new and has not been warned about my dad. while doing the regular blood pressure check and things went to look at his tonsils because he said his throat hurt. When he opened his mouth, out came your fake tounge with a nut and bolt in it. I thought the nurse was going to have a heart attack! She screamed and jumped back. It was hilarus. but the moral to my story is that his blood pressure was a little high before his joke, and after she re took it after and it was normal. Laughter really does help to heal. I can not thank you enough for doing what you do. You bring laughter to so many people. and I am seeing first hand just how much it really helps. My dad should have been gone a long time ago, but with his “practical jokes” that he plays on everyone, me included, it keeps our spirits up and help us not to loom over what we all know is coming. There it is! The smoking gun. Proof that humor makes you better. My point? This brave man would surely advise the rest of us NOT to wait until we are dying to start to access more humor, laughter and a sense of lightness. If laughter can improve and inspire this man, couldn’t it help us with our (comparitively lame) problems? CHeck out my Motivational Speakers website about humor in the workplace keynotes and humor and healthcare trainings and seminars here. This guy needs a hobby. He apparently thinks it’s fun to stuff poisonous snakes in his mouth for fun. Hasn’t he heard of checkers? Or maybe needle point? 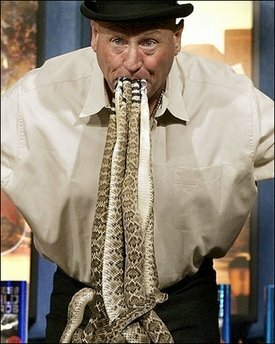 Mouthfull : Jackie Bibby, aka “The Texas Snakeman,” holds in his mouth ten 2 ft. 6-inch-long western diamondback rattlesnakes for 12.5 seconds without any assistance to set a new Guinness World Record for Most Live Rattlesnakes Held In Mouth. I’m glad he has passion about something, but sheesh! Learn about how we can have some fun without stuffing reptiles into our pie-holes here. https://www.bradmontgomery.com/wp-content/uploads/2018/11/logo-1-495x198-1-300x120.png 0 0 admin https://www.bradmontgomery.com/wp-content/uploads/2018/11/logo-1-495x198-1-300x120.png admin2006-12-21 21:50:482006-12-21 21:50:48Does this guy have a sense of humor or a death wish? In this episode, I interview corporate comedian and inspirational / motivational speaker Steve Rizzo. Based out of New York, Steve uses his skills learned as a stand up comedian in his current job as a motivational speaker to teach people how to find their inner Humor Being. Steve has been a friend for a long time, when we met in Kansas City at a speakers bureau showcase, and I’ve always thought he was funny. But in this conversation, you’ll hear the serious part of Steve. I always think that it is fascinating to hear people who are professionally funny step OUT of their humorist shoes and talk about the impact of humor and laughter. Steve Rizzo talks about enjoying the process of living, and enabling ourselves to have and better use our senses of humor. One of the many points he makes is that although most successful corporate employees will have definable goals and to do lists, very few of them include “enjoying ourselves along the way” on their lists of goals. And that if we want to learn from them, we need to systematically choose to use humor in our lives, and to enjoy ourselves, our families and our jobs. Steve believes that the ability to use our senses of humor is available to all of us; to everybody on the planet. And that although we might not be always able to teach all people how to be funny, we can teach everybody how to laugh at funny things. We need to know that there is a difference between laughing at something that is very serious and laughing at the fear that the serious situation creates. For example, Steve reminds us that the successful TV comedy M*A*S*H* used a ton of black humor. And that Hawkeye was one of the most successful doctors not only due to his skills in the operating room, but also because he was most able to keep his life (and sanity) in the balance through his use of humor. Want to hear a comedian talk in a serious way about humor? Then this episode is for you. Want to learn about my work as a motivational comedian speaker? Click here. There is more and more scientific evidence for about the healing power of humor. (Check out the American Association of Theraputic Humor for more on this weird and cool connection between humor and health.) 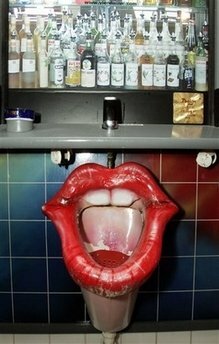 If I worked in health care, there is no way I wouldn’t order me up a buschul full of these bad boys! Your patient (and customer!) 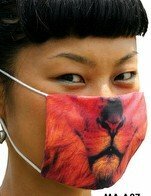 would have to be asleep to not react to you when you wear one of these goofy medical face masks. Not only would that be good for the patient (because, as I said before, humor heals.) But it would be good for business. My point: humor in the workplace is fun. But it can create tangible and measurable benefits for you and your customers; it can change your bottom line. Take a chance; play! Need a motivational speaker to speak to your hospital or health care group? Just need a laugh? Call me. Happiness and Science Finally Get it Right! Don’t you just love it when you get something right? Scientists have finally made a measurable connection between positive thinking and happiness. More than money, family, pets, or security, what makes us most happy is actually going through a process of noticing what makes us happy, and then try to think WHY those happy things occured. The result, common sense tells us (and now science too) is that this type of exercise is that through our ENTIRE day we concentrate on the good things that happen. (Because we’ll have to report them later.) And when we focus on the good, the bad becomes less important. I’m so glad for this news… this will be one of the three things today that made ME happy. https://www.bradmontgomery.com/wp-content/uploads/2018/11/logo-1-495x198-1-300x120.png 0 0 admin https://www.bradmontgomery.com/wp-content/uploads/2018/11/logo-1-495x198-1-300x120.png admin2006-12-11 23:06:272006-12-11 23:06:27Happiness is Obvious to all But Scientists.